The other day, I saw a request on a Facebook Forum that went something like this : I want to start a business. Please suggest one in which I can make a lot of money fast. My big mouth, or should I say, fast fingers couldn’t resist and I responded that the individual needs to find out what makes her happy and where her interests and passion lay. I wasn’t surprised when she ignored my comment and went on to ask someone who promised her ‘easy money’ for a phone number! Our relationship with work is very important to our happiness. I have an important question for you. Do you enjoy the time you are away from work very much more than you do the time you are working? If yes, then perhaps you need to seriously thinking about whether this is the work you are meant to do. I believe that each of us has a deep calling and if our work is not giving us soul satisfaction then may be it’s time to move on to something that does. But could it be something to do with how you are approaching your work, your attitude towards it and what you are putting into or not putting into your work? Either way, it’s our responsibility to find the work that gives us joy or change our attitude towards work. Remember, this is something you might be doing for the next 20, 30, 40 years and it’s important that your work keeps you engaged and productive. 1. What are my valuable strengths? 2. What is the work that satisfies me at a soul level? 3. What are my weaknessess? 4. How do I learn and work with others? 5. What type of working environment makes me engaged and productive? 6. What holds me back from doing the work I love? This calls for self awareness and courage, but it’s worth our time, our effort and focus. 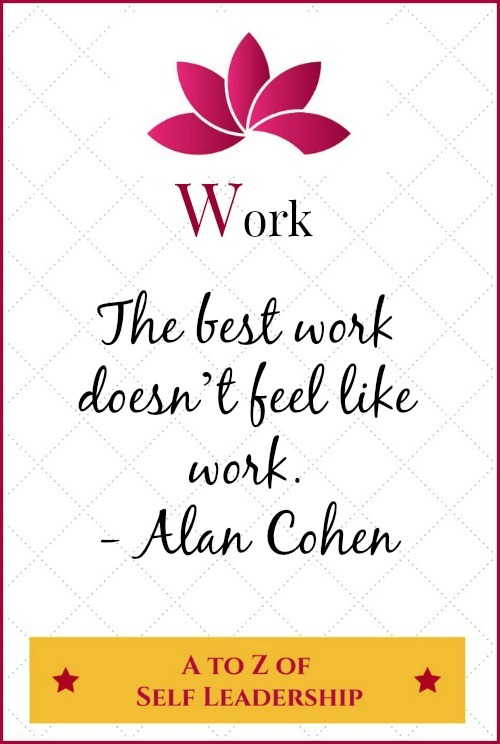 Let’s choose to make our work worthwhile! Today I’m on ‘W ‘ of the Blogging from A to Z April Challenge. My theme is the A to Z of Self Leadership. I’m also undertaking the NaBloPoMo for April – the theme is ‘grow’ and the Ultimate Blog Challenge. Very meaningful post corinne, agree with you; also agree with Fab…. the kind of orientation we get in school does not lead us to get into work that we enjoy… with systematic issues in our country… we have to go beating around the bush to ensure a secure life first and then look for what gives meaning…. but as rightly pointed out in this post, satisfaction and meaning in work can keep us always happy, and also make us productive and successful… .. glad to be here..
Everything you’ve said is true, Corinne. However, the fact remains that parents and teachers sort of steer children towards certain paths that have nothing to do with their skills or aptitude. By the time they realize that their passion lies elsewhere, they’re probably already married with kids and a mortgage! It becomes too risky to let go of their boring but earning job at that point. We need a desperate change in our mindsets and educational system! For some of us, finding the right vocation may take one’s lifetime. Money is what is required to live in this society, since we don’t do barter and subsistence agriculture isn’t functional. To find the balance of what the world needs and what we have to offer isn’t always easy to find. Another awesome post Corinne. Great advice for those who are wealthy enough to choose their work. The trouble with America is so many people are struggling to make ends meet. What would you say to a person in that situation? I have never done a start up business, but, I have never been in a situation where I needed to. I imagine, it would be quite an adventure, if the end goal in sight was potentially profitable, and I had a personal interest in what products or services I would be offering. How true this is and at the same time it can be a luxury to do work we love. We can, however, always work WITH love.